While our hard-working students take a much needed Thanksgiving break, you can check out something created by the Teva Pharmaceuticals Summer Interns. Over the years, they have made some amazing videos and this one is HILARIOUS. Just make sure you’re not too full of turkey and mashed potatoes to laugh. There are more great videos on our YouTube page. 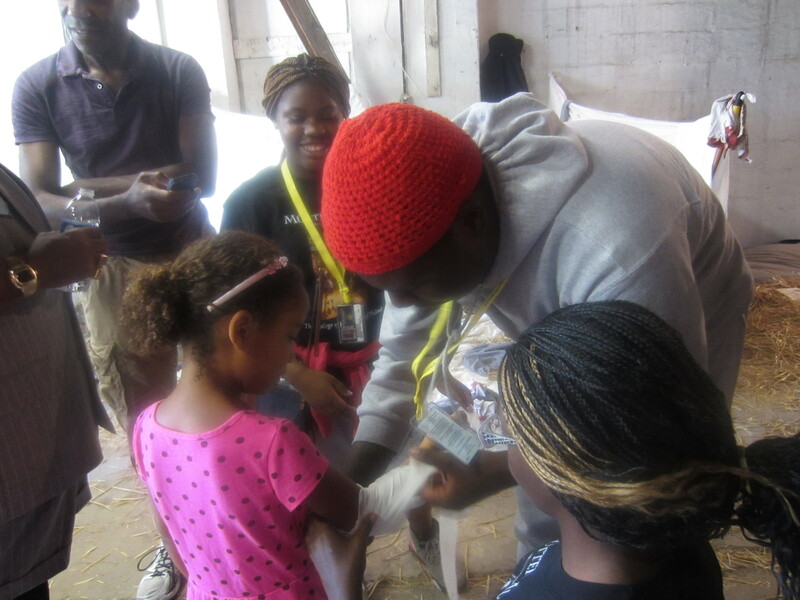 If you bury a body and try to move it, the Karabots Junior Fellows will catch you. They’ll look at the dirt that’s jammed way up in the body’s nose and they’ll determine the the original burial location. If that location happens to be your backyard, you’re out of luck, buddy. That’s how good they are. 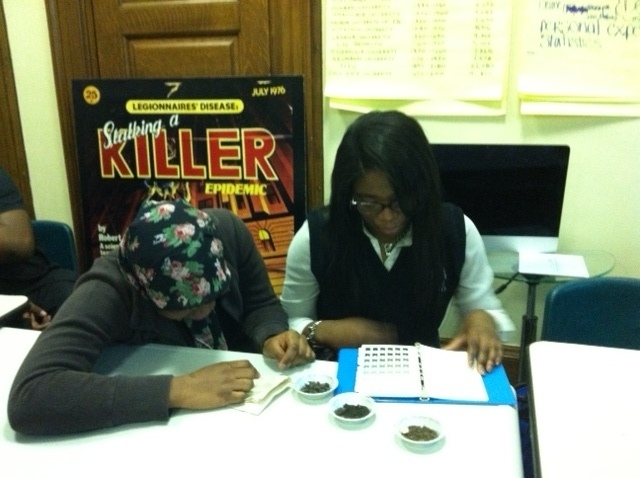 Look at the picture below, they can identify different types of soil by touch alone. Sand, clay, silt, loam, it doesn’t matter. That’s right, they know what loam is. And if you give them a copy of the really expensive book that lets you color match the soil types, you’ll be doing life. We guarantee it. Forensics lessons continue after Thanksgiving. We’re building a team of world class, Grade-A crime fighters here at the College. Don’t you forget it. We don’t blame you if you got a little freaked out by what you saw in The College’s Medicinal Garden this past Saturday. 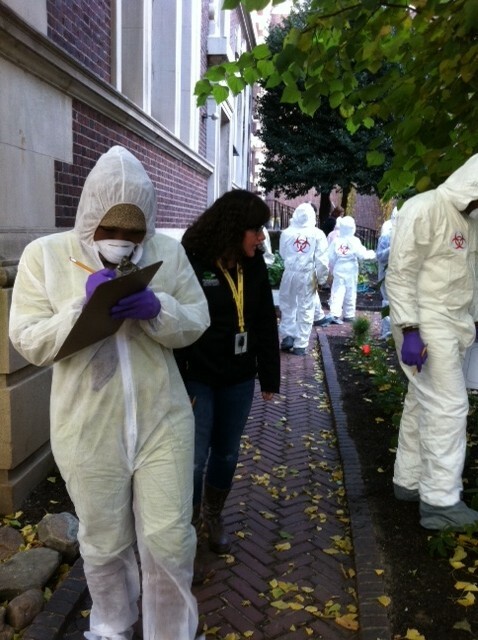 Don’t worry, there wasn’t a bio-hazard scare. No Museum specimens escaped. And, no, we weren’t collecting ectoplasm samples. 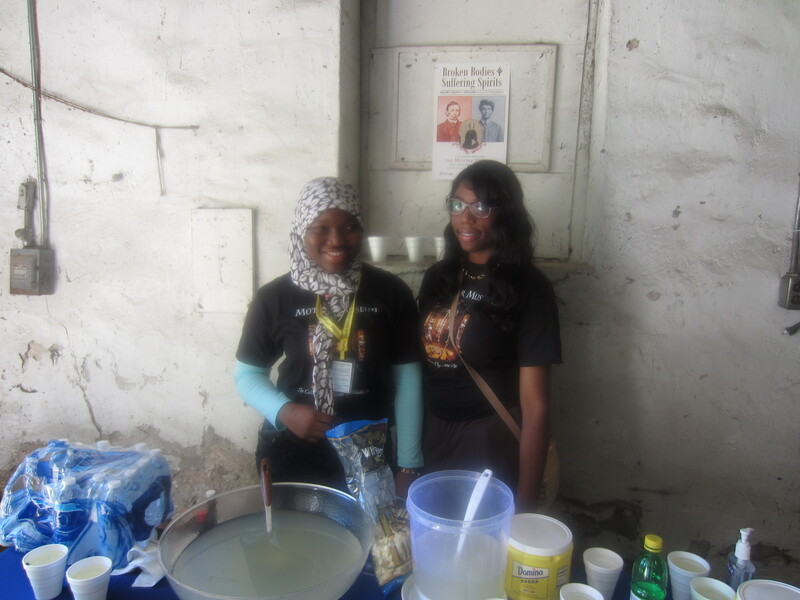 It was the Karabots Junior Fellows doing what they do best: learning. 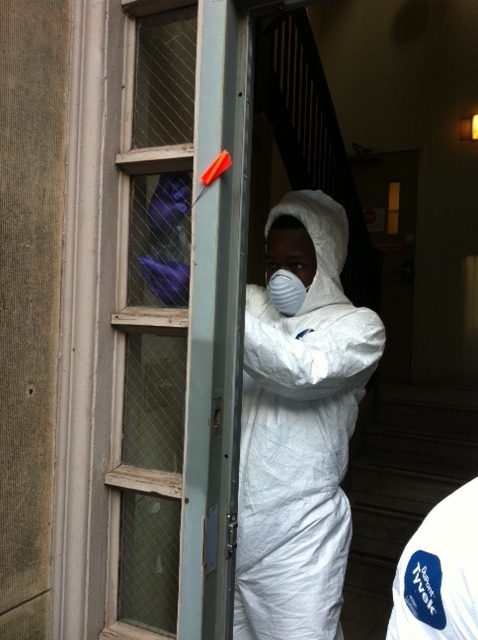 We’ve moved on from this semester’s Civil War Medicine unit and we’ve hit the ground running on Forensics. This Saturday, our Garden became the scene of a fictional break-in (and, really, why would you break in when you could just sleepover?). 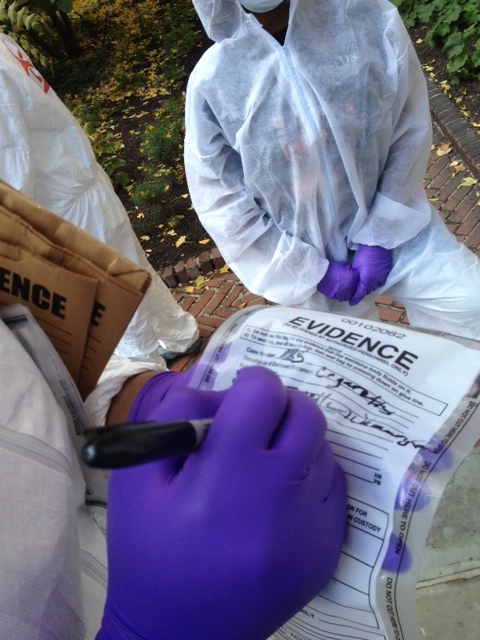 The students did everything the real CSIs do, including bagging evidence. In this case, it looks like our perp took a smoke break on his way out the door. Never a good idea. Some got a little practice lifting fingerprints from glass. 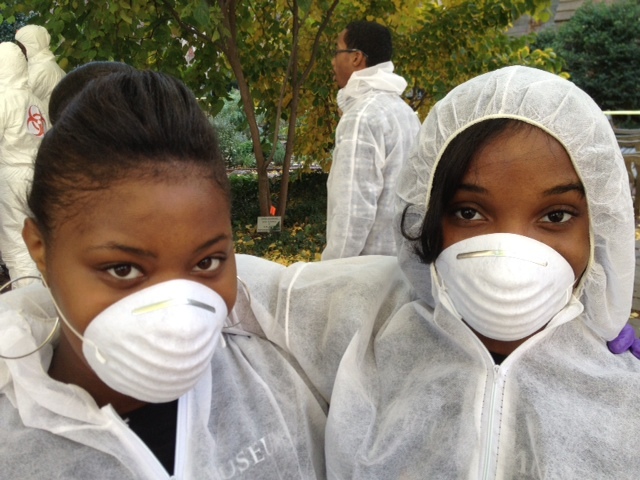 While others simply tried to look their fashionable best in a Tyvek suit and dust mask. 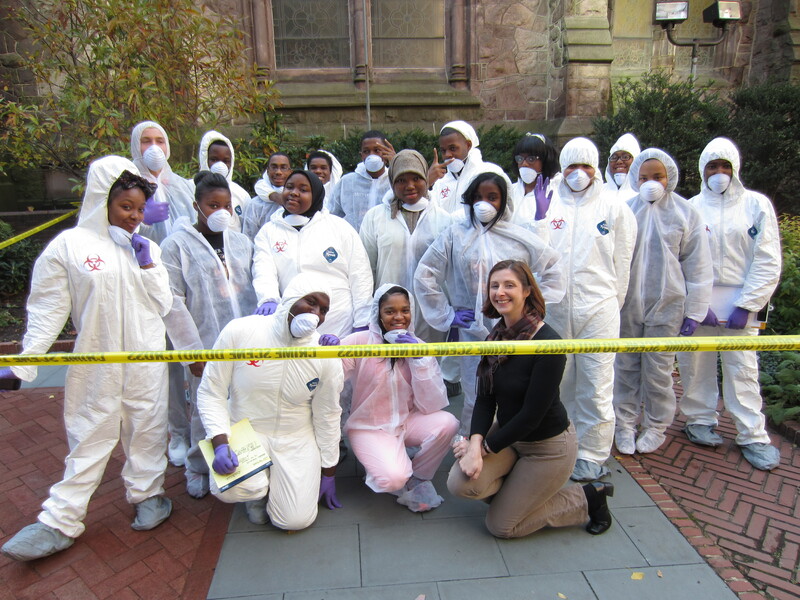 We’ve got plenty still to learn about the fascinating field of forensics. Fingerprints, blood work, soil samples, the list goes on. By the end of the semester, we’re even going to put together a crime scene for our friends and family at our end of semester party. Stay tuned for that. In the meantime, we’ve got to thank the fabulous Kimberlee Moran for her amazing help. 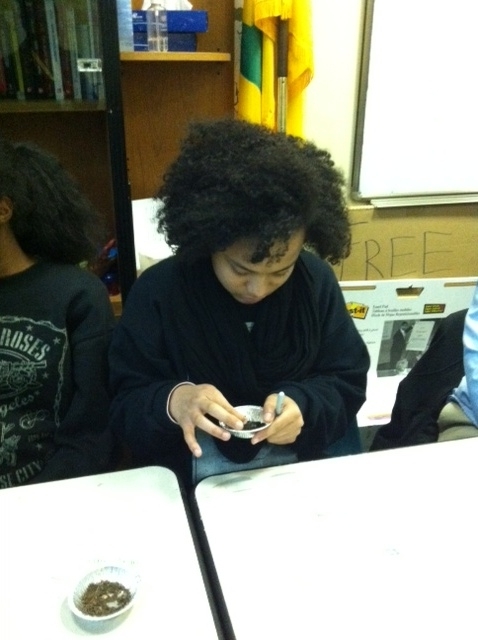 Seriously, if there’s anything you need to know about forensics, just ask Kimberlee. She’s the one without Tyvek on. 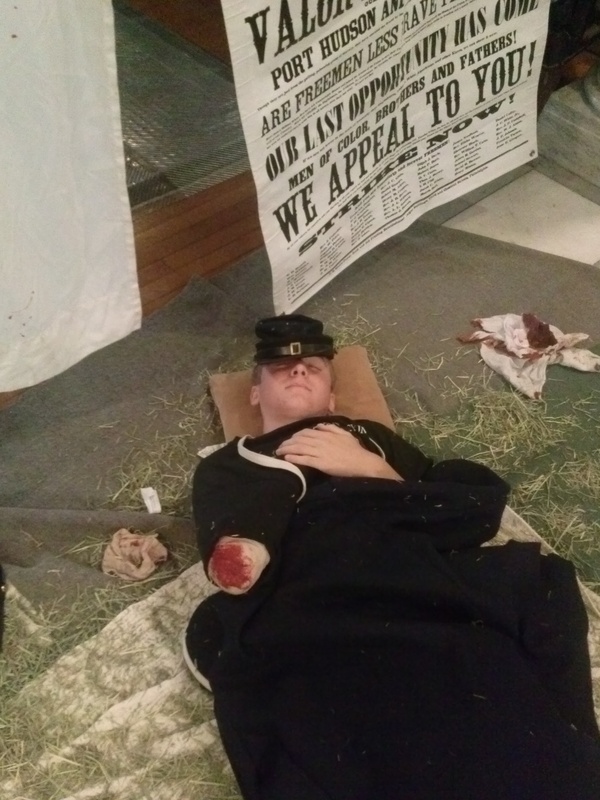 Reprising their roles as wounded soldiers and assistant surgeons, the Karabots Junior Fellows set up shop at the College on October 19th as part of Civil War Hospital Day. 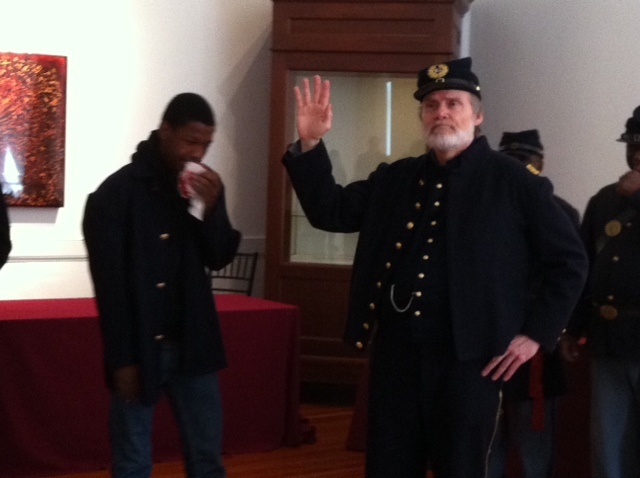 The event featured guided tours of the College’s new exhibit, Broken Bodies, Suffering Spirits: Injury, Death, and Healing in Civil War Philadelphia, as well as the re-enactors of the United States Colored Troops performing drills and even Civil War-era music. But our favorite part? Sick call. Were our soldiers too sick for duty or just faking it? You be the judge. We’re not even sure “loose teeth” is a thing but it didn’t keep Sara from trying to fool Dr. Hicks. He seems suspicious. 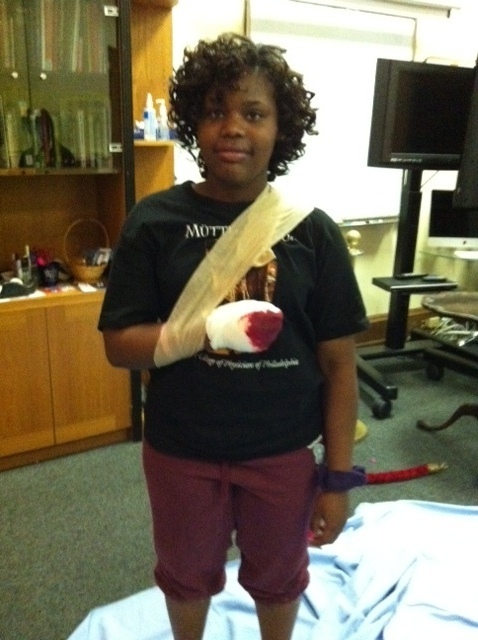 Essence, that hand looks bad. But you can’t turn up out of uniform. The blood on that rag is scary, Jahlil. You stay away from us. And, David, what can we say, you should probably stay right where you are. And here’s a picture to prove it. Her name is Natasha Trethewey and she was lovely to talk to. 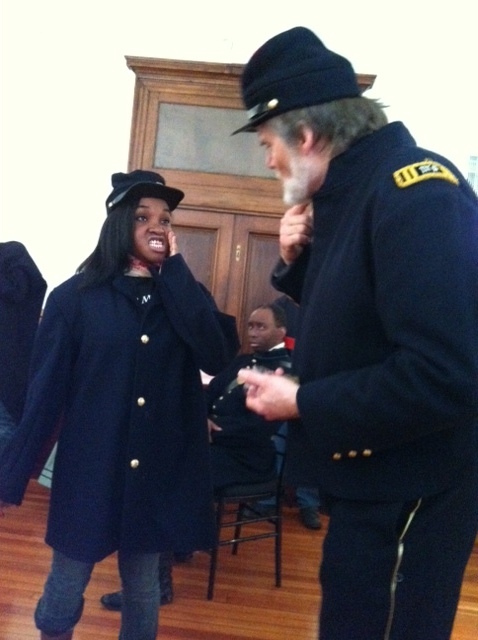 Her book Native Guard tells the story of an all-black regiment in the Union Army during the Civil War. It won the Pulitzer Prize. And she took the time to talk to us. Just sayin’. And getting tips on how to fill your army-issue hat with stolen potatoes. 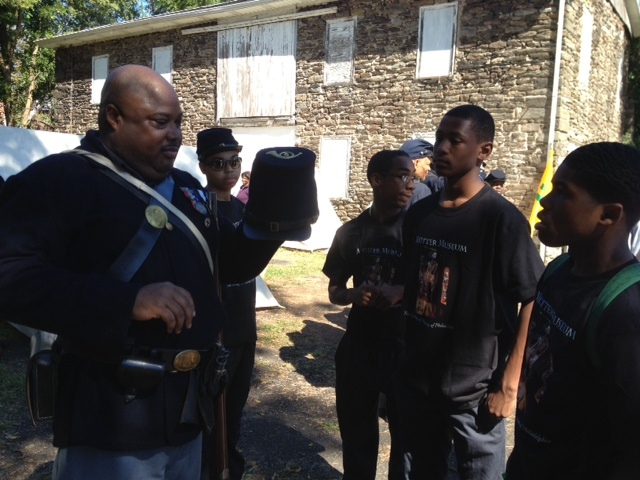 Much thanks to the organizer, Joyce Werkman, and the United States Colored Troops for inviting us. The event was a roaring success and we were glad to be a part of it. If you haven’t been out to visit the Camp, do so. It’s an amazing piece of history and a chapter of the Civil War story that doesn’t get told as often as it should.